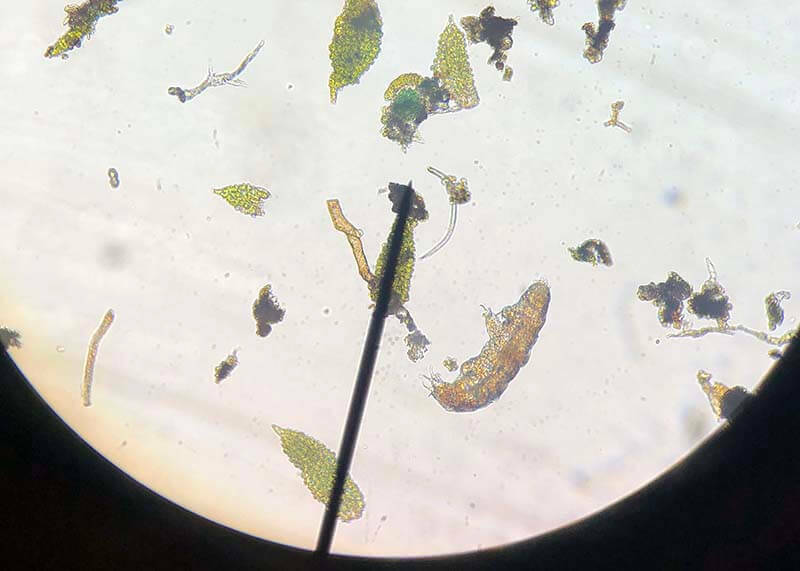 This project was created for AP Biology students where they scrape lichens from trees near campus and filter them over night so that tardigrades and other microorganisms can be collected from the water. The project includes a set of research questions that students can explore prior to collection day. I have them organized into groups so that each team can take a section (anatomy, ecology, habitat, physiology) and then report their findings to the rest of the class. This was done in class and took about 15 minutes with students using their phone to find information. 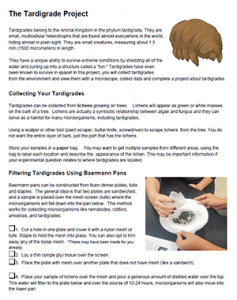 Instructions for setting up a baermann pan are included, which is a simple way to filter out tardigrades. Basically, two styrofoam plates and a mesh screen made from tulle are used to create the pan, and lichen samples sit overnight. When students return to class, the filtered water is poured out and examined under a stereoscope. My students were really excited about the organisms they found, which included nematodes, rotifers, and of course, tardigrades. I even wore my tardigrade shirt and showed them my tardigrade plush. The final project gives students a choice about submissions. They can created a narrated video of their tardigrades, a captioned photo, or perform an experiment on the behavior of the tardigrade and submit their observations and summary. Students that could not find tardigrades have the option to compare groups and suggest reasons for why some samples are better than others. It does take a lot of patience and microscope skills to find tardigrades, so this is not recommended for beginning biology students. This photo was taken by a student using their cell phone and a light microscope, magnification 100x.